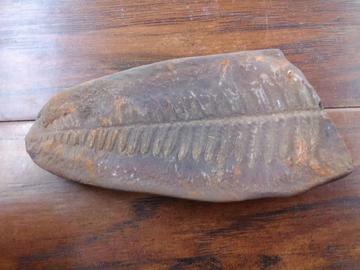 Annularia is a plant fossil from the Carboniferous period. They are the leaf whorls of an extinct horsetail. These horsetails, grew to a haight of 30 feet in a tree-like form. They were indicative of a humid, web habitat such as a lake shore. 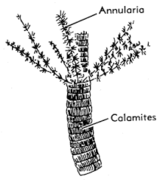 Calamites itself is the name originally given to a stem section, but now applies to the entire plant. Size: 3 5/8" x 2 1/4"
* This item also comes with an information card.